Hi! 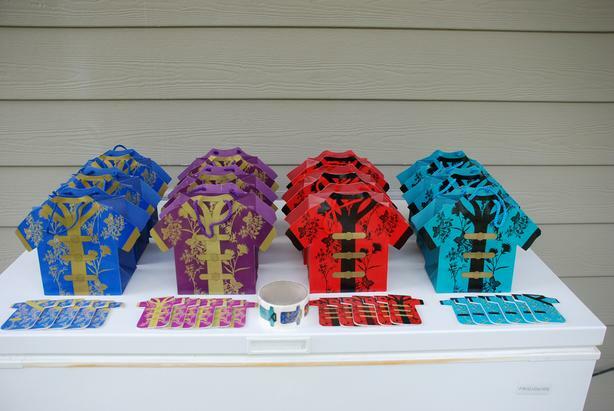 I have 3 lots of Chinese-themed party supplies for sale - 12 gifts bags, 22 matching notepads in four colours, and a roll of stickers all shaped like traditional Chinese shirts. These items are all brand new (never used) and were ordered on-line from the USA for a party a few years ago. The party never happened and so these supplies have been stored away ever since. Here are some further details about both items. An unopened roll of stickers in the same pattern and colours as the gift bags above - blue, teal, purple, and red. I am asking $30 for everything sold in one lot. I am located in Vancouver, BC but shipping is no problem. I will be happy to mail these Chinese New Year party supplies to you using CanadaPost and Interac bank transfer. So, if you are interested in purchasing, e-mail me and we'll figure out the logistics and/or I can answer any questions you may have. Thanks!